This post had an unexpected starting place. 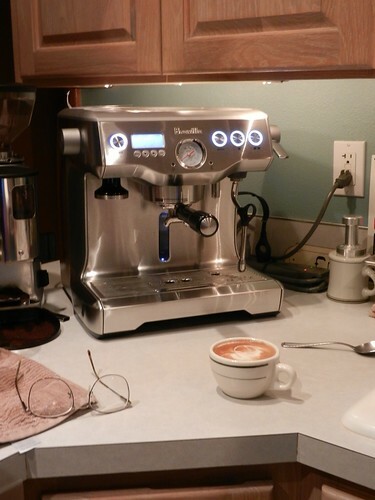 I sat across the table from Mauri a few days ago and noted the large empty space left behind after he shipped off his espresso machine for repair or replacement. The whole story has been unfolding over the course of several months while Mauri tried to quiet the unacceptable screeching noises it was making. Somehow in the process I’ve forgotten the repair or replacement part of the story. Naturally, the vacant counter space catches my attention in the same way you’d notice your couch had been removed from your living room. It’s been part of our kitchen landscape for, well, 23 years. But that’s not entirely true. 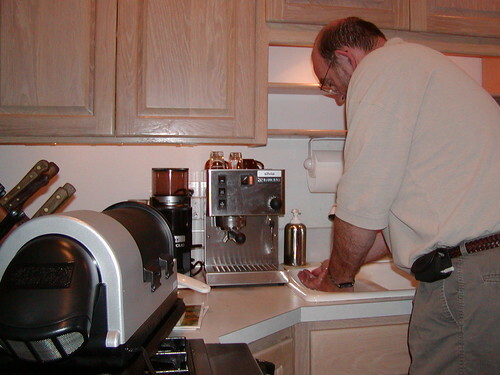 I’m fairly certain Mauri’s first espresso machine is safely stored in the garage in its own carrying case. A coffee affectionado such as my dear man needs to pull his own caffeine shots, even when on the road. 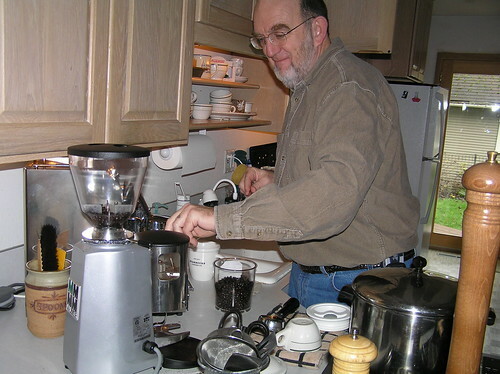 But this photo goes back to 2001 and shows his roaster and grinder as well. In fact, at one point in time we even had a little display on our cookin’ room mantle—a display, not a shrine! 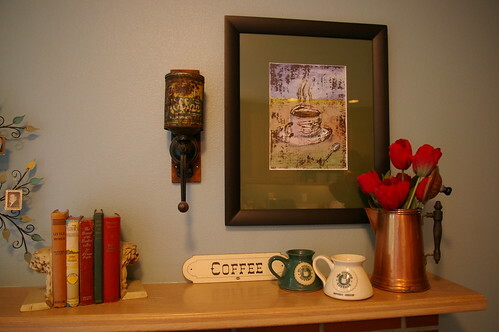 The Coffee Cottage mugs are originals and I’m sure would be collectors items by now. Mauri spent quite a bit of time (and money) at the Cottage when he was a single dad. 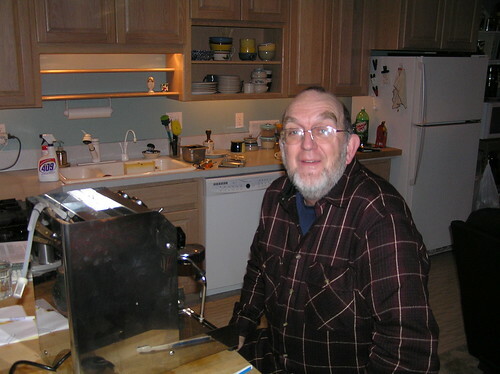 Circa 2005, flushing the plumbing lines or something. The picture will have to speak for itself. 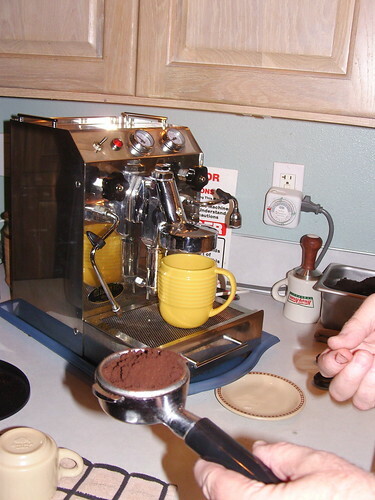 And finally, this 2012 version, a Breville, is what he uses now, though it’s been repaired or replaced several times, likely why I can’t remember which of the two is happening as we speak. To know Mauri is to love Mauri. 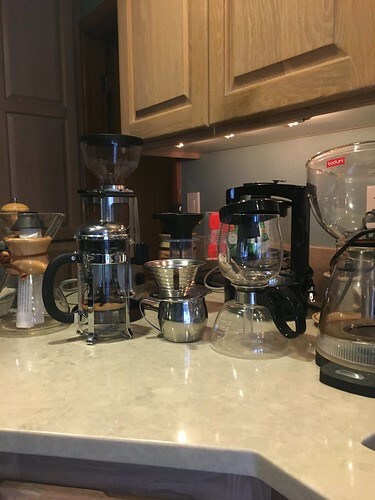 He made quick work of filling that space with some (certainly not all) of his other coffee-making gadgets that live up in several of the high cabinets in our kitchen. 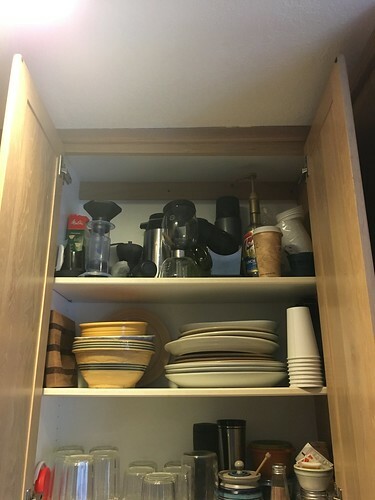 To assess the ratio of coffee-related to other kitchen-related stuff in our cabinets might indicate I actually DO care. But I don’t, so I won’t. Besides, I can’t reach them anyway.